What Day Of The Week Was February 26, 1993? 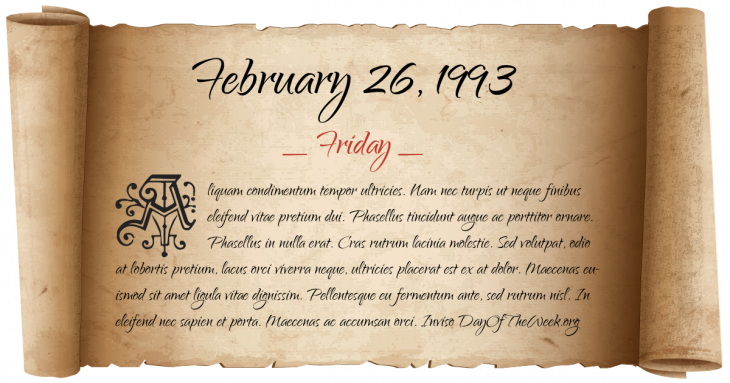 February 26, 1993 was the 57th day of the year 1993 in the Gregorian calendar. There were 308 days remaining until the end of the year. The day of the week was Friday. A person born on this day will be 26 years old today. If that same person saved a Penny every day starting at age 4, then by now that person has accumulated $80.90 today. World Trade Center bombing: In New York City, a truck bomb parked below the North Tower of the World Trade Center explodes, killing 6 and injuring over a thousand. Who was born on February 26, 1993?